IT outsourcing is the simplest, most cost-effective way for companies to hire qualified IT professionals for specific IT jobs without having to commit to the significant costs of maintaining an in-house IT team. With IT outsourcing services, small and mid-size companies can benefit from expert IT experience any time that it is needed. At Forward Slash Technology, we are a local IT outsourcing provider serving businesses in the St. Louis area and around the country. Our IT outsourcing services include completing one-time assignments as well as performing ongoing IT maintenance and monitoring services. To learn more about our IT outsourcing services including the types of services we offer, please contact our IT company. You can also contact us to request our local IT outsourcing services for your business or to learn more about how our computer consulting firm can help your business handle its IT services. IT outsourcing can have many benefits for small and medium-sized businesses utilizing these outsourcing services from IT professionals and experts. For small, medium, and large size businesses, IT outsourcing can allow access to an IT staff as needed with significantly reduced costs over employing and maintaining a large IT department. It will reduce overhead and free up resources including office space and equipment. It will free your executives from the hassle of day to day processes, and improve the speed of service you receive for your IT needs. Cost Savings: For many businesses, IT outsourcing offers significant cost savings over hiring and maintaining a full team of IT professionals. 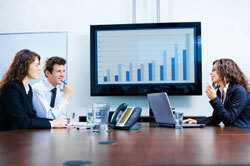 With IT outsourcing providers, businesses can access the professionals and experts they need in a cost-effective way. Access to Experts and Professionals: IT outsourcing allows businesses to take advantage of the expert advice and skills of IT professionals as needed to complete large projects or to solve network problems. Increased or Decreased Service to Meet Changing Business Needs: When using an IT outsourcing provider, businesses can have access to the precise level of workforce they need in order to offer IT consulting services, perform hosting or maintenance services, perform network security auditing services, or complete network redesign or implementation projects. IT professionals enjoy working for IT outsourcing providers because it allows them to work on the types of projects that they love. Qualified programmers, content generators, system admins, and other IT professionals enjoy the flexibility they receive from offering IT outsourcing services as needed to different local businesses. To learn more about these and the other IT services available to businesses from our IT outsourcing provider, please feel free to contact our IT company.